Master Document for long works? as a user of Scribus (currently using the development version) I'm very proud of all its features, which are really professional. The version 1.5.4 suits the most of my current needs. There is just one major problem when I'm working with it, because I want to layout books (which, sometimes, can be really long). At this moment (09/2017) it is quite problematic to work with long documents and chains of text. The solution would be quite simple: to have two types of documets: -regular documents, and -master documents. By master document I mean an archive which includes and syncronize the regular documents. That's possible in InDesign (they call it "Book"), and even in LibreOffice (master document). 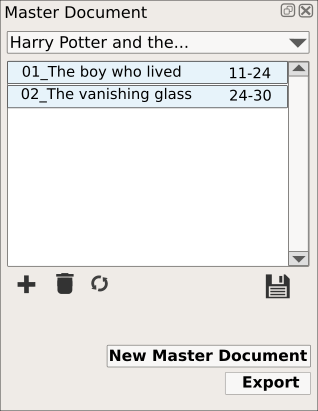 Does someone knows, if Scribus will have (someday in the medium future) such option? Or if the team are even interested in the improvement of Scribus working with long documents? Right now I used Scribus for simple designs and for finishing other projets from Gimp or Inkscape. But Scribus would have, in my opinion, much more potential if it would have any kind of master document, to split the long documents. Re: Master Document for long works? yes, that would be a good feature! -Export Master Documents, which means: Scribus can merge and export several single documents as one PDF, without opening every single document (for a large book, we would save an amazing amount of resources). It would be extremly powerfull, if we can export a 300 pages book, for example, without opening all the documents/chapters. If Scribus doesn't need to open the documents for exporting them, but just export the Master Document. -And here, I guess, a difficult one: creating an index of contents using all the documents within a Master Document. Of course, it could be always improved and improved, implementing more advanced features, but if Scribus would do the things described above... Well, it would be an amazing jump of quality for Scribus, from my point of view. and create one pdf per file, which you can merge with external programs. i will not even try to support the attributes based table of contents. so i consider that scribus cannot create a table of contents. but as soon as the "real" style based table of contents exists, an interface for the scripter might be very useful! i'm not sure that the scripter api supports all this, but i can give a try. the mockup you have created looks neat... but i fear it's still a bit far away... but a poor man master document system could be possible. That would be a really amazing first step. In Adobe InDesign is ths implemented since eternity. At least since CS2 is it implemented (2005). Here is another request for this feature. Thanks.